The Prosers: Look, a blog post! I'm doing okay. Better. Not great yet, but I'm taking my medicine, exercising, writing, reading scriptures and awesome books, and eating brownies while I listen to music. I'm getting stronger, and I hope to get back to where I was before this bout of depression began. This won't be a long post, because Pyromancy is behind schedule, and I've got some writing to do. 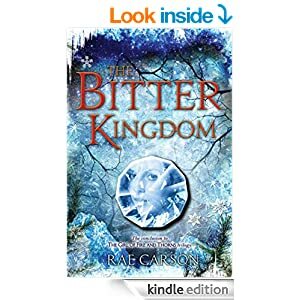 But I recently read The Bitter Kingdom, which is the conclusion to The Girl Of Fire and Ice trilogy and I've got to talk about it. I love that series. The world building is brilliant, the plot constantly surprised me, and Elisa is one of the strongest characters I've ever read. She's a phenomenal leader, and so smart, and likable. It's a great, great book and a satisfying end to one of my favorite books ever, The Girl of Fire and Thorns. Then I read a few sentences that changed this great book, into a favorite book. Maybe even a holy book, at least for me. A special book, that did what books are for, and taught me a lesson that made my life better. "You look beautiful," Alodia says. I startle at the compliment. Then I smile. "I'm beautiful to the one person who matters." She nods. "Hector's mouth will drop open when he sees you." "I hope so. But I meant me. I'm beautiful to me." Those were the words I've needed to hear for a long time. Those were the words I've been looking for, and thank you Rae Carson for finding them and speaking them so simply so they could teach me. Sometimes I read books, and I think, I can do better than that. Sometimes I read books, and I despair because I know no matter how hard I work I will never be able to craft a story that gorgeous or turn a sentence so beautiful. And then I read books, like The Bitter Kingdom, and I don't think about me at all. All I can think is to hold that mound of words and think...this is what I want to do. This is why I do this. This is why I keep trying and growing and reading and gosh, you darn book, thank you for existing. When I read books like this one, I forget I'm a writer, and I'm just a reader, in love with a book. I love these books so much. Elisa is one of my favorite heroines ever. She's so real. I'm glad you liked it, and that you're finding your way out of the deepest depths of the pit.